Congress passed a new tax bill that went into effect on January 1, 2018. It will affect most taxpayers for the 2018 tax year. This is one of the largest tax reforms in our country’s history and most likely, there are parts of it that will have some affect, hopefully positively, on your 2018 tax returns! You may be wondering exactly how you will be affected by the tax reform. Let’s dig in and see exactly how it affects filers for tax year 2018. Here at Tax Alternatives II, we hope to take the headache out of your life by making filing your tax returns for 2018 easy and worry-free. 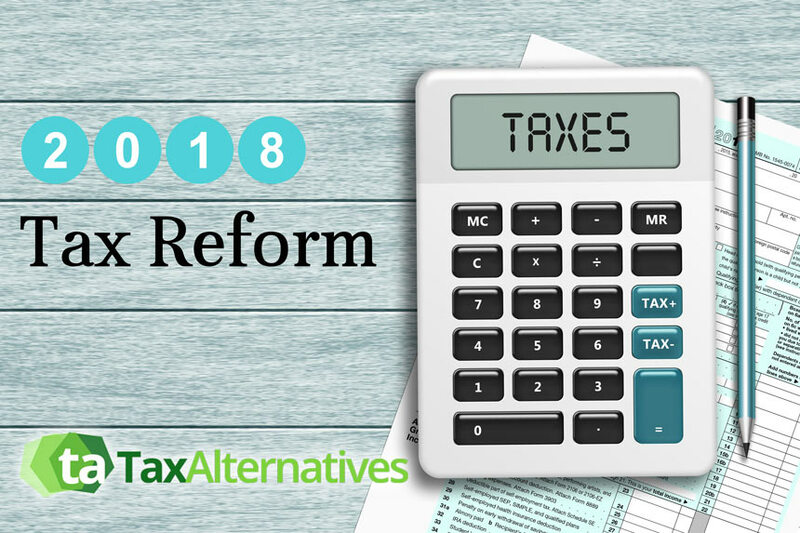 We aim to help you by breaking down some of the new 2018 tax reform in this article. The income thresholds for the seven tax brackets have also undergone changes. Increased Standard Deductions: The standard deduction amount nearly doubles for both families and single filers. For single taxpayers, the standard deduction goes from $6,350 to $12,000. Married couples who file jointly, will see an increase from $12,700 to $24,000. The goal of this standard deduction increase is to make the filing process more simplified by reducing the amount of itemization you will need to do. Increased Child Tax Credit: The child tax credit is twice as much for families with children. For each child, filers will get a $2,000 credit as opposed to the previous $1,000 credit. The actual refundable amount also increased from 2017’s $1,100 to $1,400. The 2018 tax reform also includes a new benefit that includes a non-refundable credit for dependents other than children of $500. The threshold was also raised from $110,000 for married couple filing jointly to the new threshold of $400,000. Health Care: 2018 tax reform took out the tax penalty for not retaining health insurance, however it doesn’t kick in until you go to file your 2019 tax returns. Personal and dependent exemptions: 2018 tax reform bill eliminated personal and dependent exemptions. In 2017 it was $4,050 and for 2018 it increased to $4,150. Mortgages and state/local taxes: The 2018 tax reform bill limits deductions on state and local property tax at a maximum deduction of $10,000 and also reduces the amount of interest on mortgage indebtedness from $1,000,000 down to $750,000. There are more changes that may affect you. In this article, we’ve covered the changes that affect most taxpayers. You can find out more by visiting IRS.gov. If you have any tax needs at all, small or large, Tax Alternatives, located in Brentwood, TN, can help! Give us a call or contact us through the form on this page to get in touch with us.